Recording voices can be used for all sorts of fun stuff, adding a voiceover for a presentation, interview students about what’s happening in the class and post that on a blog or use it as a way to interview experts to gather research. What ever the reason, if you’re going to use it, then read on past the break to get a good idea on how to do it properly. Enjoy and if you see anything to add or I should change then leave a comment! For our podcasting project we will want to select Voice. It will then ask you to name and save the project. After that we’re ready to get started. 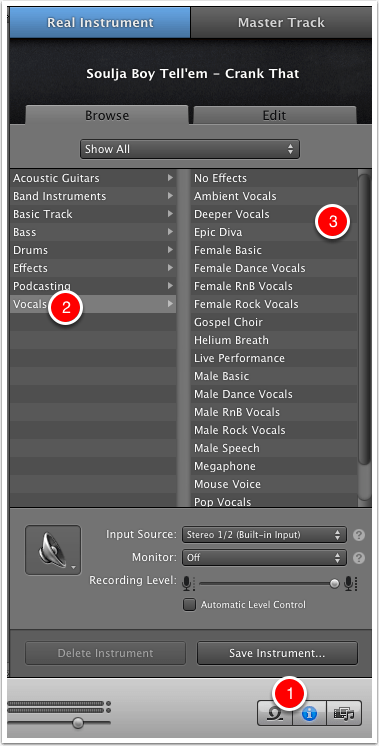 When you open your Voice project you will notice that there are two tracks. We only need one. To delete one click on it and hit ⌘ + delete. That will delete the track. For podcasting we want flat and unaltered sound. 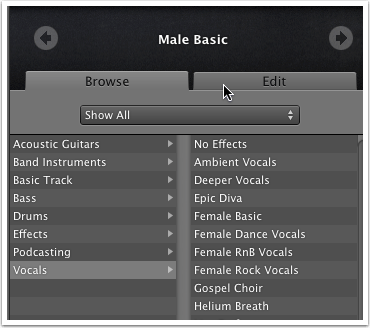 GarageBand adds reverb to each vocal track automatically so we need to turn it off. Here is how we do that. Click on the track you will be recording on. Click on Edit (on the right hand side). Now click on the blue box for the Master Reverb. That will shut it down. 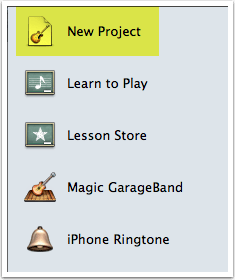 GarageBand is set up to count measures (the rhythm of a piece of music). Since we’re recording mainly voices, it is better to know the actual time. Click on the music note and select the watch face. Now it will show us our time instead of the measures. 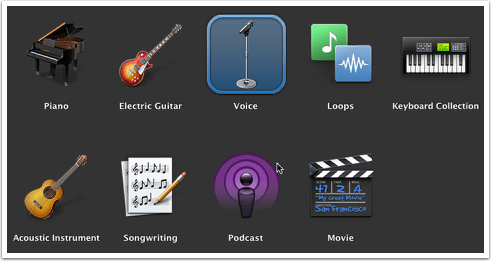 GarageBand can let you set the recording level. You will need to click the “i“ icon in the bottom right hand corner. Then you can select the recording level. I suggest experimenting with it to make sure it is picking up your voice clearly. To record make sure you have the proper track selected and prepare yourself. Then all you have to do is click on the record button at the bottom. Once you click the record button it will record immediately, there is no countdown. To stop recording simply hit the Space Bar. That will end your recording. Sometimes you will need to edit and delete some parts of your tracks. This is pretty simple. First select your track you want to work with (it will turn Orange), then find the part you want to edit. Now hit ⌘+ T. This will split the track. Simply select the part you want to delete and hit Delete. If you need a very specific part and are having trouble finding the exact moment, GarageBand can help you. On the left hand side towards the bottom you will see this slider. If you want to add a little spice to your track, you can occasionally add some effects to your voice. There are more than a few to chose from and used sparingly can be very effective. First you will need to edit your track to isolate that portion you want the effect on (see instructions above). Then you will need to get to the effects. Look at the picture below and make sure you follow the markers. This will get you to the effects. Then select your effect and smile. This will allow you to save it anywhere on the computer or a USB drive. 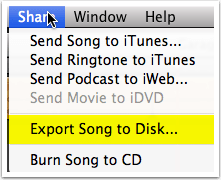 When you click Export Song to Disk… this window will open up. 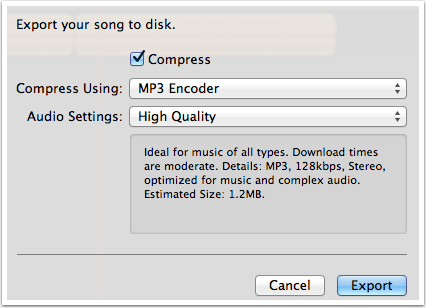 You can select MP3 or AAC formats (read about them here or go to http://bit.ly/vuNw9s). Select between Good, High, and Higher quality. Obviously the higher the quality the larger the file size. If you know what you’re doing then you could also select Custom. Then hit Export and let GarageBand do its thing. You’ve recorded, edited and published your first GarageBand project. Nice work! Just an FYI, you now have two files: a GarageBand file and an audio file. GarageBand files will NOT play on any mp3 player (including iPods/iPhones/iPads). You need to use the exported file for that. Enjoy! This entry was posted in Patrick Cauley, tutorial and tagged garageband, recording, voice. Bookmark the permalink.